It's time for my favorite blog post of the year! Every year I look back through my archive and pick out what I feel were my top 10 photographs of the year. Oh what a year it has been! I added many new images to my archive. I was incredibly busy with commercial and Real Estate photography. I had a great summer selling prints at the Vista Gallery. And I recently bought a new camera. Thank you to everyone who has hired me, bought prints, and shared and liked my photos on social media. You have helped make this a great year for me. 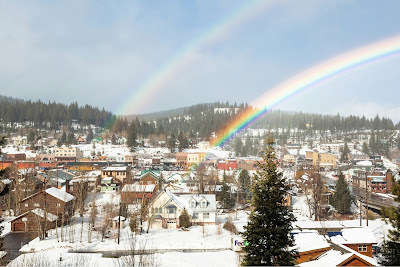 "Double Rainbow Above Downtown Truckee" - Photograph of an intense double rainbow above a snowy historic Downtown Truckee, California. 2. It's always a tough choice when it comes to picking a spot to shoot a sunset on Donner Summit. There are tons of photo opportunities up there. This day, I decided to shoot this old stump instead of shooting under Rainbow Bridge. Boy am I glad I did! 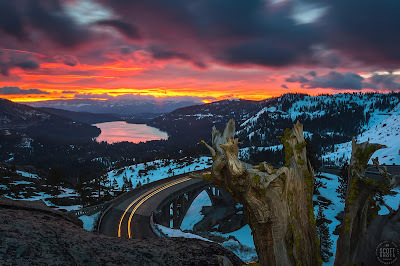 "Donner Lake Sunrise 13" - Photograph of a vibrant sunrise above Donner Lake and Rainbow Bridge with a old dead stump in the foreground. 3. and 4. Two of my favorites were shot at the same location, a couple days apart. The Camas at Sagehen Meadows is always a fun spot to shoot in the spring if the wildflowers bloom big. This year I got out for some night/sunrise fun with a couple photographer friends. Then, when it started snowing a couple days later, I got out again for one of my all time favorite images. When I look at the snowy, soft, abstract scene, I feel at peace. 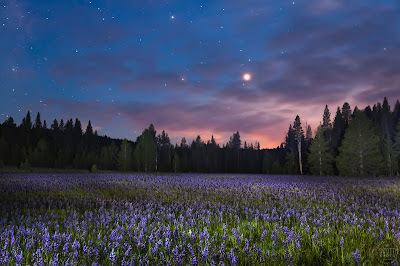 "Sagehen Meadow at Night 1" - Photograph of the Camas wildflowers at Sagehen Meadows, near Truckee, California at night. 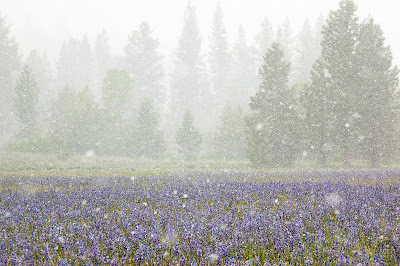 "Snowy Sagehen Meadows 2" - This field of Camas wildflowers was photographed during a snow storm at Sagehen Meadows, near Truckee, California. 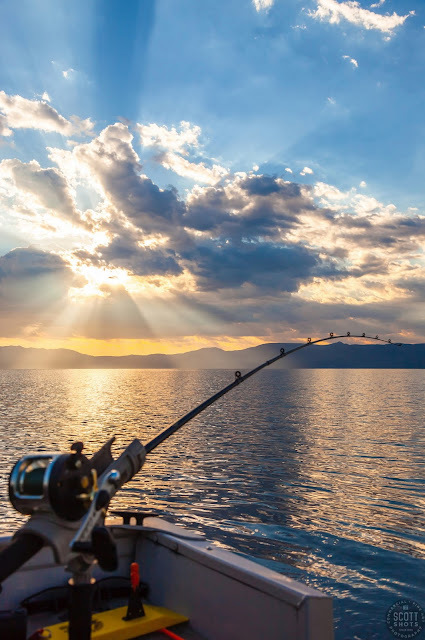 "Fishing Pole at Lake Tahoe 10" - Photograph of a fishing pole at Lake Tahoe with crepuscular rays in the sky. Shot near sunrise during the annual Jake's on the Lake charity fishing derby. 6. OK, now this was a fun one to shoot. I knew I was getting something special. Lake Tahoe's water level rose and flooded some of the lupine along the shoreline. The lupine are always a favorite for Tahoe photographers but this is a look you don't see often. 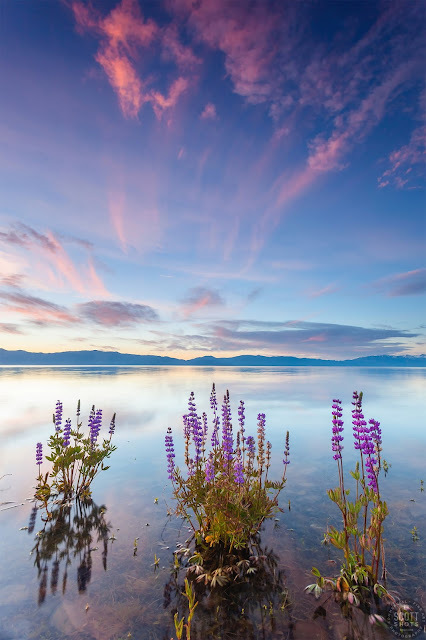 "Tahoe Lupine at Sunrise 4" - These partially submerged lupine wildflowers were photographed at sunrise at Lake Forest Beach, Lake Tahoe. 7. Who doesn't love fireworks?! This was shot from near the fire lookout above Kings Beach, Lake Tahoe. The Vista Gallery, where I sell my prints out of, can be seen in this shot. 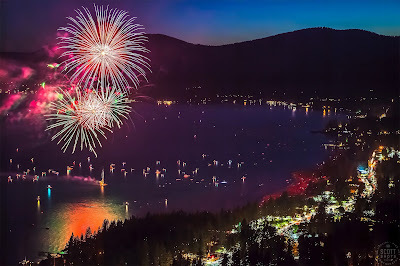 "Kings Beach Fireworks 1" - Photograph of the 4th of July fireworks show above Kings Beach, Lake Tahoe. "Tahoe Boulders at Sunset 13" - Stitched panoramic photograph taken at sunset of boulders near Hidden Beach, Lake Tahoe. 9. Aspens and Lake Tahoe! I was introduced to this location this year, I have a feeling I'll be back. It was a great year for the aspen fall colors and when you have a background like that, you can't go wrong. 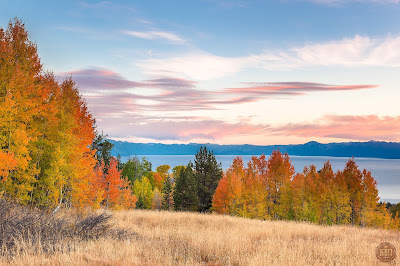 "Aspens Above Lake Tahoe 3" - Photograph of yellow, orange, red, and green fall colored aspens above a blue Lake Tahoe, taken at sunset. 10. New toys! Well really it's a tool for work but it still feels like a new toy. I recently purchased a Canon 5D SR. It's one of Canon's 50.6 megapixel cameras and I'm loving it. I haven't had time to get too many landscape images with it yet but here's one, a long exposure during windy/wavy conditions. I really look forward to getting many new images with this camera in 2017. 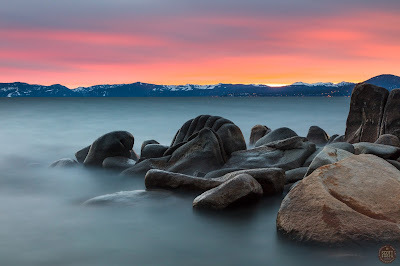 "Tahoe Boulders at Sunset 16" - Long exposure sunset photograph of boulders along Lake Tahoe's east shore, near Hidden Beach. Cheers to 2016! May 2017 be even better! The images above are available as large fine art prints or as stock photography. Please click on an image to view it on my website and for purchasing options.